Piccadilly line. © Tim Marshall 1992. 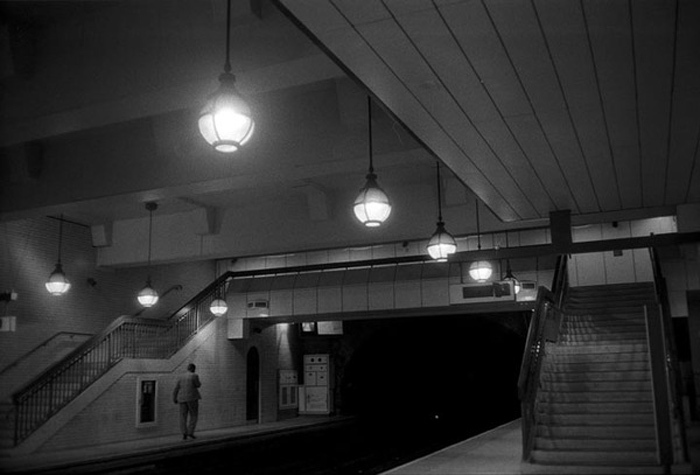 After an inquest into an Underground suicide in 1921, the Westminster Coroner observed: ‘There was something about the roar and rush of the Tube train which was terribly fascinating to a person if he were alone on the platform.’ Alone-ness may be an important consideraton. Two hundred people try to kill themselves under Tube trains every year, of whom half are successful. The number has not risen commensurate with the great increase in Tube usage of recent years, and my friend Stuart, who works on the Underground, says this is ‘because people are embarrassed about doing it in front of a crowd.’ He added, hauntingly, ‘On a Sunday night back in the late Sixties, it was only you and the driver anywhere east of King’s Cross.’ In-house at the Underground, they are known as ‘one-unders’ or ‘jumpers’. But in her novel King Solomon’s Carpet, Barbara Vine writes: ‘Even those who cannot dive, who would not dream of diving into water, dive, not jump, in front of the oncoming train’. I cannot say whether this is true.